I always head for the warehouse district when I’m in a new town. With thousands of hard-working men in pants covered with spackle or diesel fuel nearby, there are generally a few meat n 3’s, diners, burger joints or barbecue stands that have risen to feed the nearby blue collar workers. Eddie’s BBQ, on the eastern edge of Lubbock in a vast zone of factories, recycling plants and heavy equipment repair shops, will not make you forget the smoked meat palaces of Caldwell County anytime soon. The heavily trimmed brisket is tender but has little flavor. The signature heavy crust of char, salt and black pepper that we take for granted in Central Texas is missing. The pork ribs are better having benefited from the cook seasoning them at some point during their time on the smoker. I get a tour of the kitchen and an Alto-Shaam begins leering at me. Many cooks use these “hot boxes” to finish the cooking process after giving their meats a glancing tour through a fire powered pit. If you want to make meat tender they do a brilliant job but they also impart a steamed flavor into whatever it is they’re used for. When I was planning my tour of the Lubbock barbecue scene a buddy of mine told me not to bother. He matriculated at Texas Tech and informed me that I’d be disappointed in what I found in West Texas. While I did find meat worth a return visit unfortunately it wasn’t at Eddie’s BBQ. 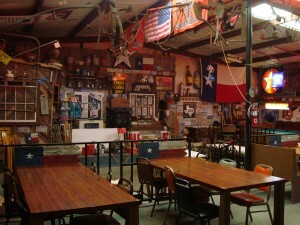 This entry was posted in Texas Barbecue, Texas Barbecue Photos and tagged Brisket, eddie's bbq, Lubbock, Pork Ribs, texas. Bookmark the permalink.